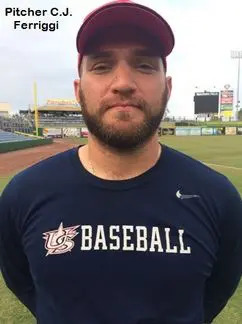 November 12, 2017, Clearwater, FL – A year ago, with his team on the cusp of a Fall Classic championship, Long Island Tides manger Max Feinberg made a fateful decision to replace his starting pitcher with home league MVP CJ Ferriggi. What transpired set the stage for a title a year in the making. Ferriggi allowed four runs in the eighth inning that day as the Atlanta Reds claimed victory. A year later, it was Ferriggi getting the start and when the Georgia Barons closed a 5-0 lead to three in the eighth, Feinberg never hesitated to make a similar move. This time, Albert Neff was able to work out of the threat with the lead barely intact as Long Island held on for a 5-4 victory. While Ferriggi maintained that fatigue never played a factor in the Georgia uprising, he knew a team championship was more important than his own pride. “Back home I’ve thrown 170 pitches, so fatigue isn’t an issue,” he said. “The [eighth inning] they got some bat heads on the ball and found some holes. Leading 5-1 and six outs from a championship, Ferriggi’s dominant effort appeared in jeopardy. Brandon Williams singled past third base, Dre Waldburg was hit by a pitch and Eric Esquilin followed with a single to left to load the bases. Feinberg made a trip to the mound where Ferriggi convinced the manager to keep him in the game. When Kameron Stewart followed with another single to left to score Williams, the pitching change was made. Neff survived a run-scoring infield error and sacrifice fly that pulled Georgia within 5-4 by getting a swinging strike out and soft fly out to left. When the closer retired the side in order in the ninth for his second save of the day – he pitched the final two innings of the semifinal – Feinberg, Ferriggi and the Tides had their redemption. On an unseasonably cool and windy day with intermittent rain, Long Island took advantage of uncharacteristic sloppy Georgia defense to take what appeared to be an insurmountable lead. Mike Rachun singled to left with one out in the second and moved to third on a wild pitch and stolen base – one of four the Tides had on the day. When Tino Mention hit a chopper to short, Rachun broke for home. The throw to the plate was in plenty of time to cut off the run, but Mention was safe when the ball was dropped for an error. An inning later Long Island broke the game open. JD Williams drew a one-out walk and moved to third on Rich McCarren’s single to right. When Nick Halamandaris hit a hard grounder to second, it appeared that Georgia would easily turn an inning-ending double play. However, the ball was misplayed for an error, one of four the Barons committed, allowing Williams to score. Two batters later, McCarren and Halamandaris scored when Rachun’s grounder down the third base line was deflected into foul territory and resulted in a double. Long Island, which reached the final by going 3-1 in round-robin play and defeating the Florida Cardinals and Sun Coast Marlins in the playoffs, scored again in the fifth on a McCarren RBI single to right. With Ferriggi retiring 13 consecutive hitters to this point, it appeared the 5-0 lead was more than enough. Georgia had other plans. A hit batsman and back-to-back singles from Ricky Castro and Williams plated a run and left runners on first and second with none out in the sixth. However, Ferriggi got a strike out, ground out and pop out to escape further damage and keep the Barons at bay until Neff came in relief in the eighth. WP: Ferriggi. LP: Schafer. S: Neff. Pitching: Ferriggi, Neff (8) and DiGenaro (LI). 2B: (LI) Rachun.